Enrich seeks to foster strategic communication around pressing policy issues by bringing together the public sector, private sector and civil society. We use the results of our research and consulting to foster public debate on key sustainable development issues. Enrich hosts regular debate and discussion sessions where relevant stakeholders from the government, businesses and the communities are invited to share ideas and experiences. Enrich Forum on Sustainable Development is an annual flagship event organized by the Enrich Institute in cooperation with development and business partners in Cambodia. Founded by Dr. Heng Pheakdey, the conference aims to raise public awareness, shape development policy, form development partnership, and create a network of development experts and practitioners and promote research activities for sustainable development. The topic of conference will center around sustainable development issues. Different theme will be selected for each year. In each conference, distinguished experts and senior researchers will be invited to be the plenary speakers. "Leadership, Multistakesholdership, and Sustainable Development"
Enrich Forum on Sustainable Development 2014 is organized by the Enrich Institute in cooperation with Royal University of Phnom Penh, Economic Research Institute for ASEAN and East Asia (ERIA), with the financial support from the Asia Foundation (TAF), the Voice of America (VOA), vKirirom Resort, and Virtus Green Plantations. The objectives of the conference are to raise public awareness on emerging development issues and challenges, shape development policy, form development partnership, and create an engaging network of development experts and practitioners. The theme for this year conference focuses on the role of leadership and multistakesholdership in promoting sustainable development in Cambodia and the Mekong sub-region at large. Leadership here refers to the capacity to translate vision into reality, to convince, influence, and empower others, and to make positive changes based on shared values. Multistakesholdership ensures that key actors are empowered to collectively articulate development agenda, encourage learning and sharing of information and knowledge in promoting sustainable development, strengthen interconnectedness, and build a resilient network adaptive to fast-paced changes and transformation. Economic development creates opportunities for the local people. However, without sustainable development strategy, it causes serious environmental degradation and other unintended social exclusiveness and fractions. Widening development gaps and inequality implicate wider social and political security implications if there is no appropriate and timely policy intervention. Therefore, it requires a transformative leadership and partnership among the public institutions, private corporations, as well as the inclusive role of the civil society organizations and the empowerment of the local communities to shape and re-direct development agenda and practices towards a sustainable and inclusive development. - What does development mean for the poor in the sub-region? - Does the current development really serve the long-term interests of the people? - Who are the bottom millions in the sub-region? - How to reduce economic inequality and social exclusions in the sub-region? - What are the impacts of hydropower dams on human development and human security in the Mekong sub-region? - What are the factors and actors that can prevent regional countries from constructing hydropower dams along the mainstream of the Mekong River? - What are the prospects and scenarios of the Mekong River management? 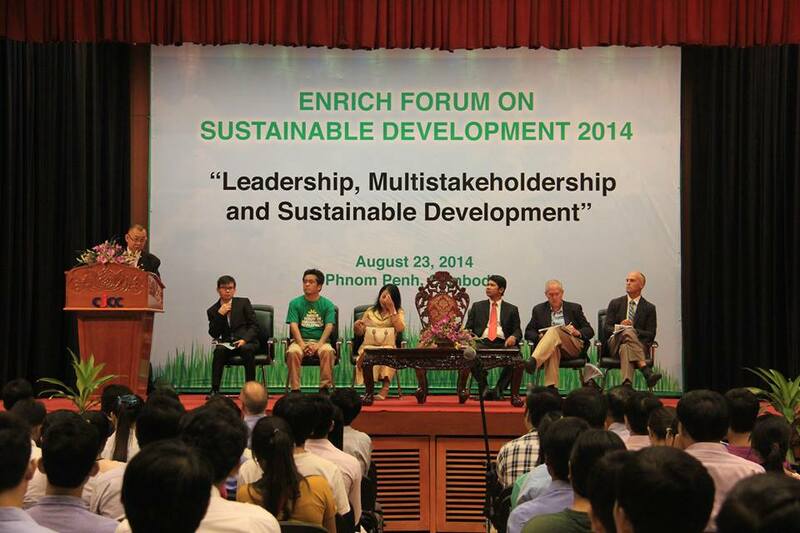 - What does leadership mean for Cambodia and for the Sub-region? - What does multistakeholdership mean for Cambodia and for the Sub-region? - How can we develop regional leadership and multistakeholdership that can provide solutions to the existing development issues and challenges? Dr. Michael R. DiGregorio, Asia Fpundation, Country Representative, Vietnam.